Well the "car dress" is finished. 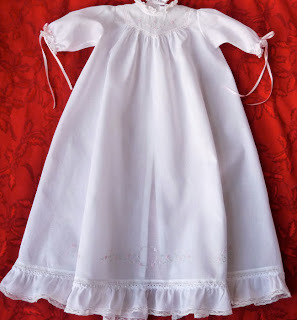 This is the gown that I have shown progress reports on here and here and here. This gown is stitched entirely by hand. As always click on the photos to enlarge them. Seams, entredeux, buttonholes, etc. All by hand. A hand project like this travels well. And since I drove to so many destinations since September, it was quite convenient. The pattern is by Jeannie Baumeister of The Old Fashioned Baby. It was the class I took at this year's SAGA convention held in Atlanta. This gown was featured in an old Creative Needle magazine but the pattern had never been printed. I don't know if Jeannie plans to publish this one as part of her pattern line or not. 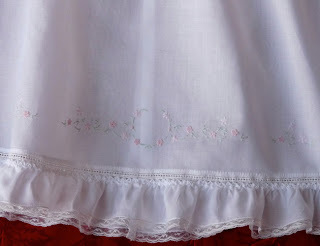 The ruffle for the hem is gathered with snail shirring. I enjoy the look of it, but wasn't wild about the process. I really do like the look of it though with the wider entredeux. 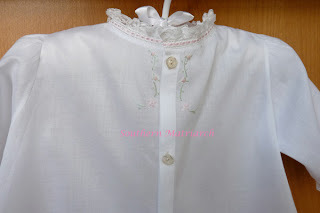 Another challenge with this gown is that the yoke is inset into the gown front. So there are no seams to set the yoke into. Here is an advantage to doing this by hand. I think you have way more control of what happens to the pieces as you stitch them together when you are doing it by hand than by machine. I did run into a small tragedy when I thought the gown was finished. I inadvertently left a needle in the gown when I left it soaking in the sink to remove the blue marks. Imagine my distress when I discovered the rust spots left behind. Who knew that a needle could rust in less than 24 hours? In the photo above you can see the shadow left by one of the rust spots. I posted my dilemma on a Delphi forum and received many hints. A friend posted this link about rust removal. I have gotten most of the rust out using vinegar. I will try it again to get the rest out. 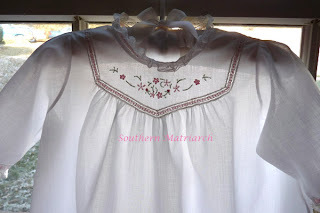 Initially I thought that there were only three little spots on the back next to the placket so I did some additional embroidery there to cover it up. 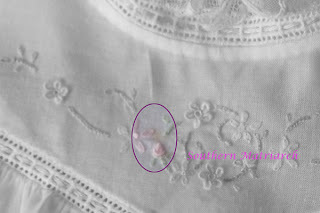 The trick with doing a fix like that is, you have to do embroidery on the other side of the placket to make it look like it was meant to be there. I hadn't discovered the vinegar solution at that point. All in all I really love this little gown. I need to make a slip for it. The Vintage T-Yoke gown needs a slip as well. I think I will do one that can be used for both. Which means that both gowns will have to go to the same recipient for that to work. Also have to check that they are close in length. 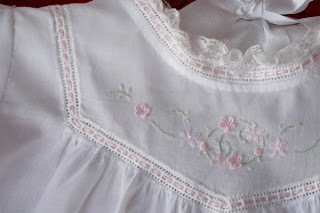 Jeannie has done a couple of blog posts about slips over at the Old Fashioned Baby Sewing Room and is in the process of doing some lessons on a Gertrude baby slip. I hope you enjoyed seeing the finished car dress. I think it will forever be remembered as such. Martha, It is absolutely beautiful! Your dress is wonderful. Please email me your address and I will happily put your Certificate of Accomplishment in the mail! Thank you! You know me I love to win! Oh Martha, the dress is just so gorgeous! I love all the lovely details. I would so love to go to one of Jeannie's classes someday. I am, sadly, on the wrong side of the country for that. But I love her blog and patterns too. Thanks Sivje, SAGA convention is coming back to the west coast in 2011 I believe. So be on the lookout. What an absolutely gorgeous dress! I am sure that you will get the remaining rust out. There is something on the market called Wink that I used years ago for the same problem. Again, gorgeous! 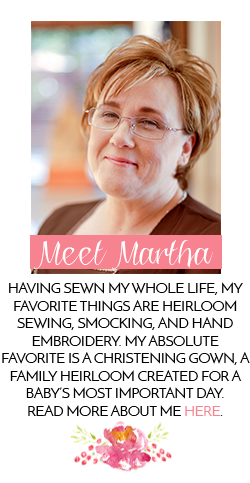 That is just beautiful Martha! As are all of the things that Jeannie does. IMHO, this should definitely go into your grandmother's hope chest, but then I would NEVER do a whole dress by hand myself. Love the snail gathering. Think about all the time it took to do just that. Have I convinced you yet? LOL? Ditto on all of the above comments. But you know what else I noticed. It's pressed so darn well! I am being serious. Cheri, I hope you see this here since I don't have an email address. I would use the skirt of the dress as the skirt of the gown. You will have to detach it from the bodice. The depending on the style of the bodice you could recut a bodice from the larger sized bodice. I would cut infant sized sleeves from the size 4 sleeves. I hope this helps. Email me if you have further questions.